Piper – Page 214 – Welcome to Wyandotte Daily! 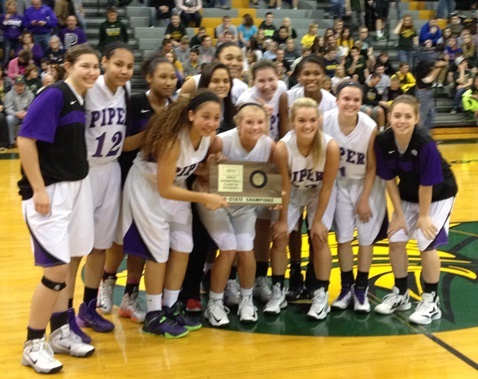 The Piper High School girls basketball team made the final four, advancing to the state semifinals with a 77-70 victory March 12 over Coffeyville. The Lady Pirates advanced to the semifinal game, which will be at 6:30 p.m. March 14 in Salina, Kan., vs. No. 1 seed, Wamego. Both teams have won at least 20 games this season. Doug Key, Piper athletic director, said Wamego has a 23-0 record this season with a 39-game winning streak. Piper this year is 20-3. Key noted that Wednesday night’s victory over Coffeyville was probably the most points scored all year by the Lady Pirates. He said Piper players who led in Wednesday’s scoring included Haley White, Megan Woolley and Jessica Wayne. In other high school basketball action, Washington High School lost 73-47 to Highland Park on Wednesday in Class 5A boys competition. Sumner Academy (10-12) takes on McPherson (20-1) in Class 4A boys basketball competition at 6:30 p.m. March 13. Several Piper High School athletes were named to Kaw Valley League basketball teams recently. They include: Kaw Valley League first team girls: Megan Woolley, Haley White, and Tori Webb. Kaw Valley League honorable mention girls team: Jessica Wayne. Kaw Valley League first team boys: Luke Long, Dominique Jennings and Vincent Eskina. Kaw Valley League honorable mention boys team: Tyler Owens.